My friend Jason Ivey shared his thoughts about Clint Eastwood’s “bit” at the Republican National Convention last week. With his permission, I’ve reprinted it here. When I saw ‘Gran Torino’, I thought it was the most modernly conservative movie I had ever seen, and I loved it. There’s something about all of Eastwood’s work that I love, especially the movies he’s directed. There’s a thoughtfulness about them that’s inherently conservative, even when the subject matter may not be on the surface. In my discussions with people following ‘Gran Torino’, it was clear to me that many people didn’t get it, and the level ofnot getting it became more pronounced the further to the left the person was. Watching the various reactions to Clint’s Thursday night act (it was more than a speech) has been both exasperating and amusing. The left’s reaction has been completely predictable: Clint’s become the ‘crazy uncle’, Roger Ebert said he diminished himself, and of course the empty chair has driven them nuts. Initial reactions from people I know loved it, some thought it was weird, and others thought it hurt because it only gave ammo to the other side. I was watching the convention on C-SPAN, because it was the only place I could without the filter of moronic commentary. At first, I wasn’t sure what he was doing either. But then, after stammering and seeming to search for words, each of his strong points were made with complete lucidity, and were brilliant in their simplicity. I thought “Wow, this is brilliant — and hilarious! He knows exactly what he’s doing, and he’s doing comedy, but with a serious message!” He moved quickly from one point to the next, quickly disposing one-liners along the way. To those who claim it was “unintentionally funny”, I think that “Tell him to do what? I can’t tell him to do that to himself!” was quite intentional. I don’t know at what point he came up with the empty chair routine, maybe just before he went on from what I’ve read. Here’s something apparently lost on the morons out there: it was a bit! In the biz, we’d call it a device. It was a clever device that served to entertain, make a powerful point, serve as a metaphor, and break up the monotony of prepared speeches, which it certainly did. Eastwood is an actor and a (brilliant) director who’s been doing this for over 60 years. He’s made a career out of using metaphors and devices such as this. He hasn’t “lost it”. You don’t direct 11 movies in the last 10 years if you don’t have all your faculties. Trust me, directing major motion pictures is an extremely demanding task — physically, intellectually, and creatively. Few people can do it, and fewer have done it as often and as masterly as Eastwood continues to do into his 80s. 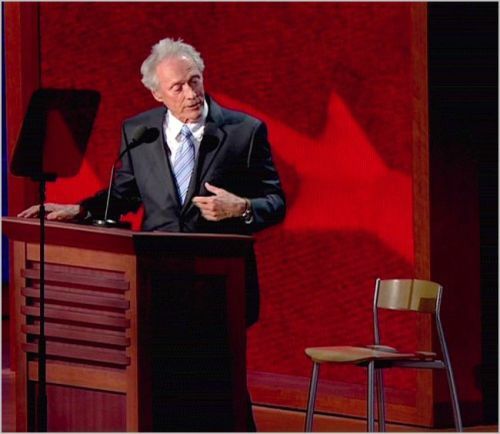 If the tables were turned and Eastwood appeared at the DNC and used the empty chair to signify Romney or Bush or any other Republican bogeyman, the libs would still be talking about how brilliant it was. We can only imagine the accolades. Instead, we’re supposed to believe that suddenly the patrons-of-the-arts left (who lavish all kinds of praise on so much artistic triviality and frivolity) fail to grasp the metaphor of the empty chair, the bumbling act that quickly turns to succinct common sense, and the daring inherent in going against the grain of his industry to lampoon Obama and Biden, the two people in the world most in need of being made fun of. This was a brilliant actor/director who knew what he was doing, and who he was doing it for. The sustained outrage tells you that it worked.